4 LAGOON COMMUNITIES, 7 MORE COMING SOON! The introduction of Metro Lagoons by Crystal Lagoons® will forever change the way you view coastal living in the beautiful sunny state of Florida. We have brought the best of the coastline to some of the most rapidly growing and sought after areas, with crystal clear blue waters that span in size from 5 acres to nearly 15 acres. Each will be surrounded by shores of resort-style fun, beauty and tropical relaxation. Whether you take part in all of the recreational activities that a Crystal Lagoons® amenity will provide or simply lounge while enjoying the incredible view, these communities will boast an elevated lifestyle found only in select spots throughout the world. Closer than you think and more affordable than you would imagine, a Metro Lagoons community isn’t just a paradise destination, it’s home. Where will these new Metro Lagoons® be located? 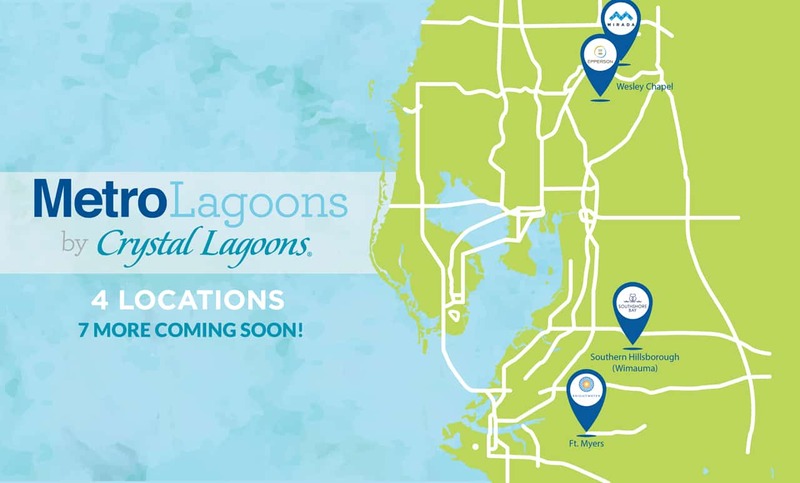 We are excited to announce that there will be ELEVEN Metro Lagoons® in West Central Florida, exclusive to Metro Places. Two of these Lagoons will be in Pasco County just north of SR-54 and to the east of I-75. A Lagoon in Southern Hillsborough County just east of US-301 on SR-674 situated directly across the street from our current community, Sereno. One Lagoon in Lee County in North Ft. Myers, just one mile east of I-75 from exit 143. There will also be an additional Lagoon located in Polk County. More details coming soon on additional Lagoon locations. How big are the Metro Lagoons® going to be? Really big! These multi-acre Lagoons are more than 100 times the size of a normal pool and on average larger than 10 football fields. 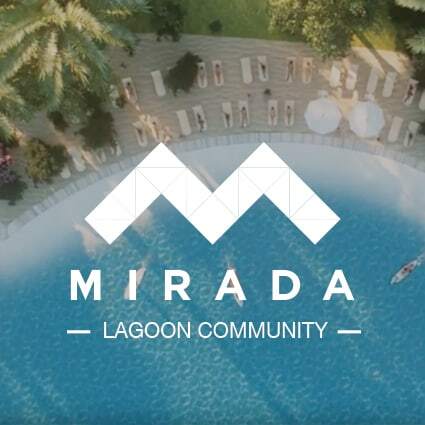 Specific community Lagoons as follows: Southshore Bay and Brightwater will each be 5 acres, Epperson is over 7 acres and Mirada will be nearly 15 acres in size. All sizes are approximations and are based on current plans. What are the price ranges of the homes in a Metro Lagoons® community? We estimate townhouse and single-family home prices will start from the $200s to over $700s. When is the projected completion dates of the Metro Lagoons®? 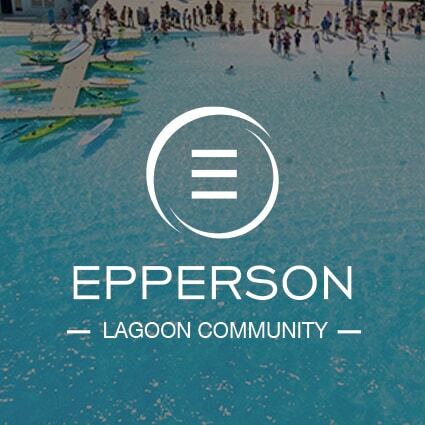 We are thrilled to announce that the Metro Lagoon in Epperson is Open to Residents! Homes are selling now and we have over 500 homeowners living in Epperson! 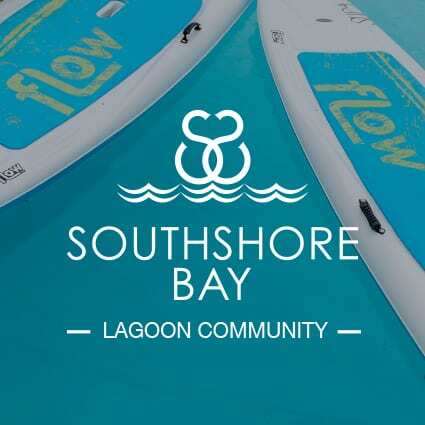 The expected completion of the Lagoon in Southshore Bay, our Lagoon Community in Southern Hillsborough, is early 2020. Mirada and Brightwater to follow soon! We can never be certain of exact dates because of construction processes, weather delays and permitting requirements, but we are working hard to complete these highly anticipated amenities. Be sure to check back here for updates or sign-up on our waitlist to stay informed of our progress. Where are existing Crystal Lagoons® Located? There are numerous Crystal Lagoons around the world in places like Chile, Panama, Paraguay, Mexico, Peru, Egypt, Saudi Arabia, Bolivia, Argentina, Colombia, Dubai, etc. Metro Development Group is proud to bring the first Crystal Lagoons® amenity to the United States. Learn more at www.crystal-lagoons.com. What water activities take place in these lagoons? Water sports that are man-powered without motors like kayaks, peddle boats, paddle boards, slides, etc. Each of the communities will have amenity offerings tailor-made to the scope of these Lagoons. How are these lagoons Eco-Friendly? Great news! Crystal Lagoons® amenities are much better for the environment from a water consumption standpoint than agricultural use and cow pasture use. The Lagoons’ technology is sustainable and safe for the environment, allowing the use of limited water and energy resources. Crystal Lagoons® amenities use 100 times less chemical products and 50 times less energy than traditional swimming pools, consumes only 2% of the energy needed by conventional filtration systems, fully complies with the most stringent water quality standards and consume 30 times less water than a typical 18-hole golf course. Plus, Crystal Lagoons® amenities capture direct rainwater so that required make-up in some locations can be zero and it should be noted that the lagoons can be filled with almost any type of water including brackish water and salt water, using potable water is not a requirement. Crystal Lagoons® technology has received several ‘Green Fast Track’ patents from the US patent office due to the environmental sustainability characteristics of this technology. Source: Crystal Lagoons® U.S. Corp.
What's the buzz been like? We’re thrilled with all the buzz surrounding this exciting project! 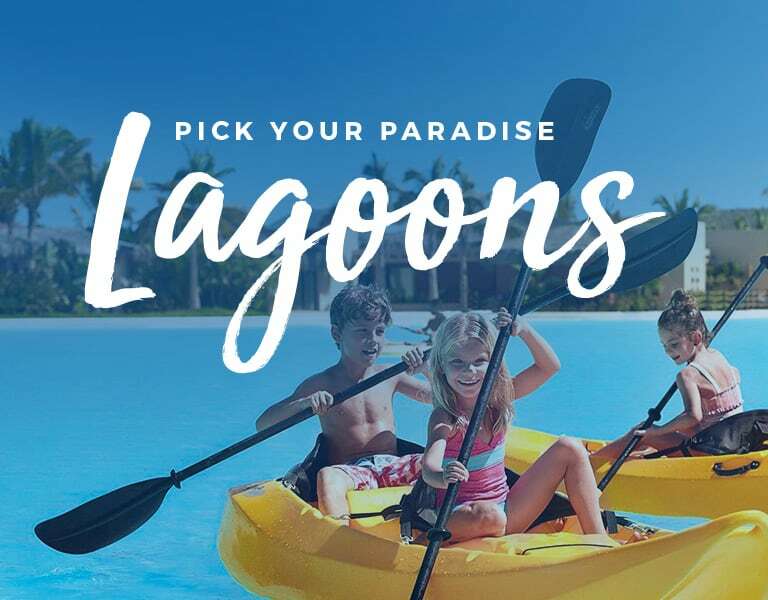 We have heard from so many of you who are looking to make a Metro Places community with a Lagoon your new home or a second home or a vacation home or the perfect “snowbird” winter retreat. 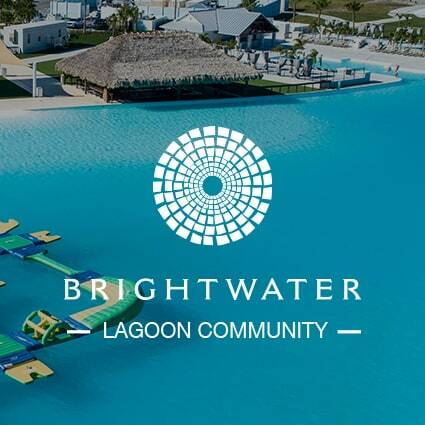 We are busy planning — not only the Lagoons, but the lifestyle amenities in and around the Lagoon to make this truly special and worthy of your anticipation. Check back soon for pictures and updates! I'm in! How do I join the waitlist? We love our growing Metro Lagoons® fan club! Simply click the Join Our Waitlist! button to the left, or go to the contact page and let us know in the comment section that you are interested in Metro Lagoons®. You will be first to know of our progress and when homesites become available.